This is our weekly look at fantasy adjustments you should make based on venue and/or weather. Entering the weekend action for Week 13 of the NFL season, knowing which players should see an improvement or decline in their projection can be a key to victory. I’ve been waiting for weather to become a major factor as we’ve moved through November, and that looks like it will finally happen in Week 13. Only a handful of games have to deal with cold temperatures, but several more have to contend with possible precipitation. That will likely affect the fantasy outlooks of several big-name fantasy players, and I have projected the impact of both the venue and weather for them and every fantasy-relevant player for Elite subscribers. Here are the matchups I find most interesting. Despite this game’s northern latitude, it looks like it will escape any major weather concerns. The temperature is projected to stay above 50 degrees Fahrenheit all afternoon, and while it has one of the windier forecasts of the week, gusts shouldn’t blow harder than the low-to-mid teens of mph. Still, I find this the most fascinating venue-and-weather matchup this week because of the Bengals’ change at quarterback. Andy Dalton has had perplexing home/road splits in recent seasons. Every other starter with similar playing time has scored better at home than on the road. But Dalton is now out for the season with a thumb injury, and the question for new starter Jeff Driskel (+0.9) is whether Dalton’s home disadvantage is unique to him or unique to the Bengals. My projections choose to give Driskel a typically modest home advantage, and that makes the rookie passer an intriguing option even in shallow formats. He ran the same 4.56-second 40-time that Cam Newton ran at the combine, and he isn’t dramatically smaller than Newton (6-5 and 245 pounds) at 6-4 and 233. Driskel has already run in two touchdowns in less than a full game’s worth of playing time this year. I wouldn’t be surprised to see him continue to score on the ground and out-produce his predecessor in fantasy because of it. I have some optimism for the Bengals’ passing game this week, too. Despite the Broncos’ ability to rush the passer that does promote quarterback fumbles by nearly 20%, they actually allow more passing touchdowns than a typical team and don’t impact interceptions. This season, the Broncos have been a better defense against the run than the pass. I’m comfortable starting A.J. Green (+0.6) — who should return from his toe injury — and Tyler Boyd (+0.6) as usual. John Ross (+0.3) has scored in three straight games, but I’d prefer to bench him to see whether he can maintain his target volume with Green back in the lineup. For Denver, the road start doesn’t help either Philip Lindsay (0.0) or Royce Freeman (-0.4), but I’m still ready to start both of them in the right kinds of leagues. Lindsay is involved in the passing game, which makes him relatively immune to venue and weather. He’s an every-week starter at this point. Freeman has carried the ball 7 and 6 times the last two weeks after returning from his high ankle sprain. That hasn’t led to a lot of yards, but it’s enough of a workload to make him a flex consideration in deeper formats. This is a great week to start him in those. 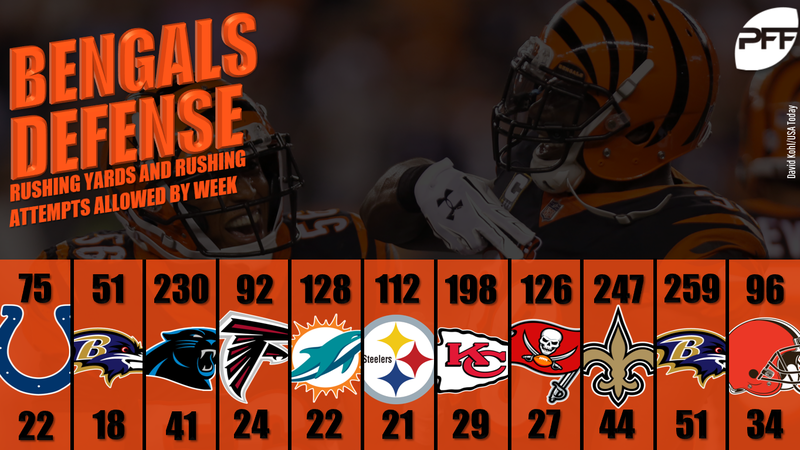 The Bengals promote rushing attempts by nearly 15%, the most of any team in football. Mark Ingram, Alvin Kamara, and Dwayne Washington had 36 carries against them in Week 10; Lamar Jackson, Gus Edwards, and Alex Collins had 50 in Week 11; and Nick Chubb had 28 last week. Lindsay and Freeman could easily reach 30 or more carries between them. I may have buried the lead because there are multiple games this week with weather concerns, and you could probably guess that one of them was in Green Bay. This is likely a game to monitor into Sunday morning because there is a 30% chance of precipitation as I write this, and with temperatures forecasted to be in the low- to mid-30s, there could be snow. Snow is the most impactful weather condition I’ve studied. It decreases offensive plays by 2.2 per team, cuts their pass percentages by 6.0 percent, and limits the per-pass production of quarterbacks and receivers. Because the odds favor clear skies, I’ve projected Aaron Rodgers (+1.3) and his No. 1 receiver Davante Adams (+0.5) for moderate venue-and-weather bumps. I’ve mentioned in recent weeks that Rodgers scores better at home and is immune to cold temperatures. However, I won’t be nearly so optimistic if Sunday brings the flurries. And even if the skies are clear, you should probably avoid the other Packers receivers. Marquez Valdes-Scantling (+0.2) seems to have lost his favoritism over fellow rookie Equanimeous St. Brown (+0.2), and that situation could be further muddled by Randall Cobb’s (+0.2) potential return. Running backs Aaron Jones (+0.1) and David Johnson (-0.6) are likely top-10 options no matter the venue or weather, but snow would make them even more attractive. Frank Gore and LeSean McCoy carried the ball 36 and 32 times, respectively, in the standout snow game late last season, and I could see Jones and Johnson following suit. With forecasted temperatures around 60 degrees, the Bears and Giants should have no fear of snow. However, their precipitation seems more likely than in the Cardinals and Packers game. Rain doesn’t overhaul offensive strategy the way snow does, but heavier rain can push play-calling close to 5% more toward running the ball. That mitigates a lot of the damage Jordan Howard (-0.4) would suffer from the road start and gives Tarik Cohen (+0.8) the biggest boost of any running back for the week. Chase Daniel (-0.8) wasn’t shy in throwing the ball 37 times in the dome in Detroit on Thanksgiving, but I expect the Bears to lean more heavily on their backs this week. Chances are they can build a healthy lead with their defense against the Giants, who likely eliminated themselves from playoff contention with a loss to the Eagles last week. Allen Robinson (-0.8) and Taylor Gabriel (-0.9) aren’t great options this week. The Vikings and Patriots late-afternoon game boasts the most fantasy-relevant players of any game on the schedule this week, and so the presence or absence of rain could swing a ton of matchups this week. Right now, it looks like the rain should clear up by late afternoon, which would be great news for all of your teams with Julian Edelman (+0.2), Josh Gordon (+0.2), Rob Gronkowski (+0.3), Adam Thielen (-1.0), and Stefon Diggs (-1.0). The Patriots get the relative bump because of home versus road, but all of them belong in your lineups. The real mystery of this game surrounds the Patriots’ running game. Rex Burkhead (-0.1) was activated from injured reserve and could easily disrupt the tenuous, elite fantasy value that Sony Michel (+0.8) and James White (-1.0) have both been able to provide. My guess is that Burkhead hurts White more than Michel because of his pass-catching. That makes Michel the safer bet this week since he also gains more from playing at home in possible bad weather. I think it’s very possible that all three Patriots backs can have value of the rest of the season, so the thing to do for now is probably just to pick Burkhead up in any leagues where he’s available.